Mark became a Virginia licensed auctioneer in 1995, and attended Mendenhall School of Auctioneering, graduating in 1993. He became licensed in West Virginia in 2013. Mark is a member of the Virginia Auctioneers Association and attends the annual convention to keep up with the latest in auction laws and methods. 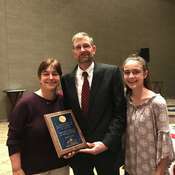 In January 2018, Mark was honored to be presented with the Jake Horney Memorial Award. This award is presented to a Virginia Auctioneer Association auctioneer who has dedicated his entire career to the auction profession and the VAA from the shadows, not seeking the limelight. You can read more about the award here. In August 2008, Mark placed fifth in the 31st Annual Virginia Auctioneer Association's State Champion Contest. He placed sixth in the August 2011 contest. In his free time, he enjoys tinkering on small engines and bowhunting His latest passion is running his beagle dogs. Mark is assisted by his wife, the former Teresa Shull. Teresa takes care of the cashier duties as well as secretarial and bookkeeper duties and maintaining the web page. Teresa also sets-up the small items for the auction. Teresa is in semi-retirement, having worked at JMU Athletics Communication as a graphic artist for almost 25 years. In her free time, she enjoys spending time with her family, genealogy, reading, and crafts of all kinds. Mark and Teresa have two children, Marissa who was an 2011 honor graduate from Fort Defiance High School, currently works at Home Depot, and got married in October 2016. Kaitlyn is in ninth grade at Fort Defiance High School. They reside in Centerville, between Bridgewater and Weyers Cave, Va. The Mark Craig Auctions Family! Mark Craig Auctions is fortunate to have wonderful family and friends to help us make your auction experience a good one! Our auction family will treat your family like their family!